When it comes to hygiene, these Newton Aycliffe cleaners don’t mind getting their hands dirty. Diamond Commercial Cleaning has now been running from premises on Aycliffe Business Park for more than 12 years. The firm celebrated its 10th birthday towards the end of 2015 after growing from a modest team of 12 and a client base of six companies to having 80 clients. But turnover and employee numbers have grown again since then, with a further 12 staff being added to the ranks, including new regional account manager Stephanie Harker, pictured with the firm’s managing director Beverley Wardrop, who assists with the day-to-day running of the business. Diamond Commercial Cleaning services more than 100 businesses across the region, covering a range of industries from aviation, to manufacturing and engineering, to chemical and medical. Diamond – which can handle all types of cleaning contracts of any size large or small, from offices to large shop floors – can also service major outdoor events. Wardrop said: “I think our success is down to the fact we’re local and we’re only a phone call away. 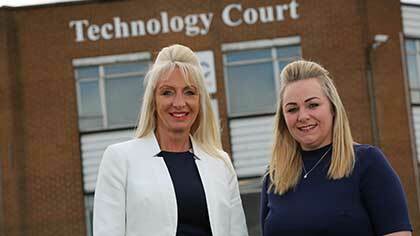 Wardrop launched Diamond Commercial Cleaning, based at Technology Court on Aycliffe Business Park, in October 2005. “We’ve earned ourselves an excellent reputation in commercial cleaning, from small offices up to large factories, building our business on customer service and high standards,” she added.